Sometimes it’s good to be a local running king. It comes with the perks of using your influence to throw a community race and help raise money for your children’s preschool. That’s exactly what Michael Wardian has done for the last four years organizing the Kinhaven School 5k. 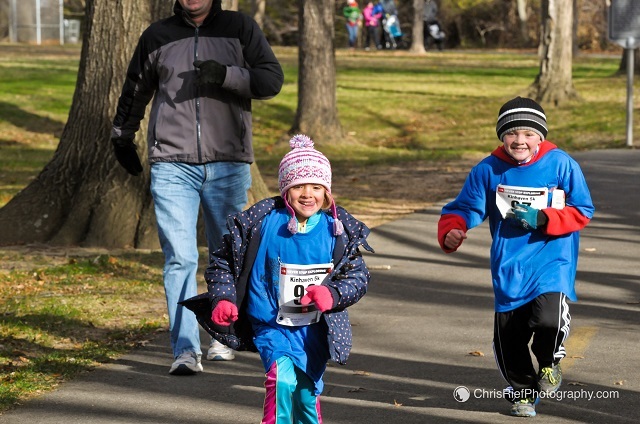 Roughly 200 runners gathered along Four Mile Run Creek in Arlington’s Bluemont Park for the 5k and children’s fun run on a frosty and windy day. The event is one of the few fundraisers the school – a non-denominational preschool near Virginia Square — uses throughout the year to raise money for the kids’ events. Wardian, three-time competitor in the U.S. Olympic marathon trials and four-time USA Track & Field Ultra Runner of the Year, is able to use the help of some of his sponsors like The North Face and Power Bar along with the weight of his name and influence in Washington’s running scene to bring people out and help operate the race. The event has raised about $6,500 in years past, but Wardian, who is assisted in throwing the race by his wife, Jennifer, hopes that number increases this year. Temperatures were in the upper 20s at the 9 a.m. start with winds gusting upwards of 20 miles per hour at times. Runners danced and moved to try to stay warm in the moments leading up to the race. Others took shelter in the cars. Speakers blared U2’s “Beautiful Day” in the minutes leading up the race and Survivor’s “Eye of the Tiger” from the Rocky soundtrack as runners took off. Wardian – who doubled as the men’s winner and event organizer – finished in 17:39. He’s now won three of the four years the event has been held, the only blemish coming last year when he didn’t run at all. Keith Freeburn, 39, of Centerville, who finished about 15 seconds behind Wardian in second place, faced a stiff headwind on the way out of the out-and-back course as did all the runners. “I just tried to keep as close to Mike on the way back with the wind at our back,” Freeburn said. The event is less about winning and running fast times as it is about coming together as a community to support a good cause. She crossed the tape in 19:37. “I wanted to run about a minute faster, but I’ve been sick all week,” she said. Wardian convinced her come out after an almost 6-year hiatus from running because of injuries. It was her first year running the Kinhaven 5k. Jason Belinkie, head coach of the Charles E. Smith Jewish Day School, brought about 10 of his runners to the race after Wardian spoke to his team earlier this year. Wardian also used his social media footprint to promote the race. This is the third year Joetta Sack-Min of Arlington has participated in the event. Her children, Jameson, 4, and Natalya, 2, attend Kinhaven, and the family views it as more than a fundraiser for the pre-school. Her husband was competing in the baby-stroller-pushing category with the kids – one of the offbeat categories. Another award was given to the top finisher running barefoot or in FiveFinger-type shoes. The race is small and holds a community feel. Arlington County permits cap the event at 225 people, which is held entirely within the confines of Bluemont Park. Organizers throw a 1k fun run for the children – many of whom attend the school – and give the kids a small, plastic medal for finishing. Behnaz Kibria of Arlington, who is the parent of a first-year attendee at the school, came out to participate with the toddler in tow. “There’s not a lot of great races that we can bring the kids to,” Kibria said. Freeburn said he would have brought his kids this year but left them home because of the weather. “The stuff that they do for kids here is amazing,” Freeburn said.